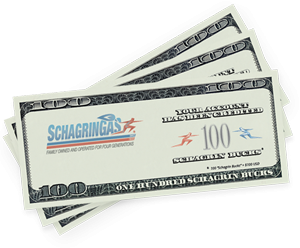 SchagrinGas offers 100 “Schagrin Bucks”* for each Residential referral. If your referral results in a new credit approved propane heating account, HVAC or qualifying appliance installation (space heaters and grills not included), we will credit your account one hundred “Schagrin Bucks”*. NO LIMIT. SchagrinGas employees, their spouses and dependents are not eligible.